Codling moth is found everywhere apples are grown, and is one of the major pests of this crop. It attacks pears, apricots, and quinces as well. Caterpillars bore small holes in the fruit, usually at or near the blossom end. Inside, the pinkish-white worms with brown heads feed on the flesh, leaving tunnels full of sawdustlike frass (droppings). Infested fruit often drops prematurely from trees. 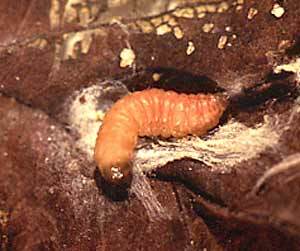 Codling moth larvae overwinter in cocoons under loose bark on the trunk or under debris on the ground. In midspring they pupate, emerging in late spring as grayish-brown moths. The females lay eggs on leaves, twigs, and fruits. The larvae feed briefly on the leaves before tunneling into the fruits. After feeding for 3 to 5 weeks, they emerge and crawl down the trunk in search of a spot to pupate. There can be up to three generations per year. Spray with the bioinsecticide Bacillus thuringiensis (Bt). You will need to apply Bt at least three times, and timing is critical. Make the first spray 15 days after petal fall begins, and subsequently at 5-day intervals. Note when petal fall begins and mark the spray days on a calendar. Orchardists use sticky traps baited with codling moth pheromone in order to time sprays exactly. Parasitic wasps will attack the caterpillars as they hatch, and are commercially available if there's no natural population.